A group of about 20 boy scouts from Troop 774 visited Pima Animal Care Center on May 7 to walk dogs and contribute toward PACC’s “Paws for Reading” program. The scouts, ages 11-15, are all members of Boy Scout Troop 744, which is chartered by Pantano Christian Church, 1755 S. Houghton Road. Their visit to PACC comes as part of the Boy Scouts’ commitment to community service. While this visit didn’t count toward a merit badge, the hours they spent at the shelter fulfilled one of their community serviceprojects. 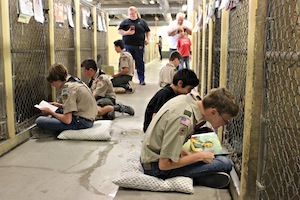 In addition to walking dogs, the scouts also read to pets as part of PACC’s “Paws for Reading” program, an activity recently incorporated at the shelter to help with pet behavior. Reading contributes positively to pet behavior as it allows pets to calm down and become more comfortable around people. 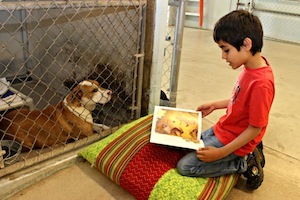 This reading program also benefits kids by providing a nonjudgmental reading parter while also increasing their empathy toward animals when seeing the positive effect that reading has on them.